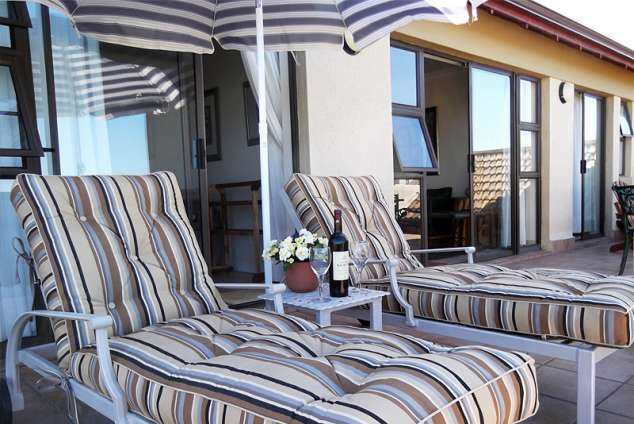 Fairways Apartment - Mossel Bay Accommodation. 12/12 - Twin bed en-suite bedroom, door to balcony. Whether you are planning to visit the world renowned Garden Route or you are planning to play golf, look no further. This luxury apartment (4 star graded by The Tourism Grading Council of S.A.) is situated on the upmarket Mossel Bay Golf Estate and Nature Reserve with 24 hours security. The estate is located in the central residential area of the town. All the major attractions, beaches, shopping areas, beaches and the N2 highway are within easy reach. If you view the photo of the establishment in the photo gallery, the apartment is the whole top storey of the building with a private entrance. The apartment is next to the green of the first hole, within walking distance from the club house where guests can enjoy delicious meals at reasonable prices. World renowned golf courses like Fancourt, Oubaai, George, Simola, as well as all the major towns of the Garden Route, are within 30 to 50 minute reach from Fairways. Make FAIRWAYS APARTMENT your "HOME AWAY FROM HOME" when visiting the Garden Route area. Guests staying at FAIRWAYS will be entitled to reduced "green fees" when playing on the Mossel Bay Golf Course. Guests who are interested in playing golf can enquire about this. Fairways is a stylishly furnished self catering apartment. It is sunny and bright, especially during the winter season, is fully equipped and everything is of superior quality. Complimentary tea, coffee and Wifi is available in the apartment. Fairways can sleep 4 guests in two luxury en-suite bedrooms. One bedroom has a king-bed and the other one twin beds. On request both can have king or twin beds. Both have sliding doors leading onto the spacious balcony for guests to enjoy the breathtaking views and scenery. Breakfast is not included but on request breakfast, at a reasonable price, could be arranged for guests at the nearby golf clubhouse or at a restaurant on the beachfront. Safe off-street parking is available. It is very safe to take long walks on the estate. From the estate It is possible to join up with a walking trail from The Point to Dana Bay. Approximately 10km from Mossel Bay there is an Engen Service Station on the right. One kilometre from there, where the N2 turns left for Port Elizabeth, continue straight onto the R102 to Mossel Bay. Continue along the R102 for 8km and at the fourth set of traffic lights a big green road sign indicates "Schoeman Street". Turn right into Schoeman Street and after 0.7km the entrance to the Mossel Bay Golf Estate is on the left. When entering the estate turn left and continue left and after 0,6km you will reach Fairways at 161 Galatea Drive on the left, just beyond the arched bridge. Take the turn off onto the R102 indicating Mossel Bay and Oudtshoorn. Follow the directions to Mossel Bay. At the first set of traffic lights turn right onto the R102. Travel for 6.5km and at the fifth set of traffic lights on this road there is a big green traffic sign on the left indicating "Schoeman Street". Turn left into Schoeman Street and after 0.7km the entrance to the Mossel Bay Golf Estate is on the left. When entering the estate turn left and continue left and after 0,6km you will reach Fairways at Galatea Drive 161 on the left, just beyond the arched bridge. 24570 page views since 15 Jun, 2007.